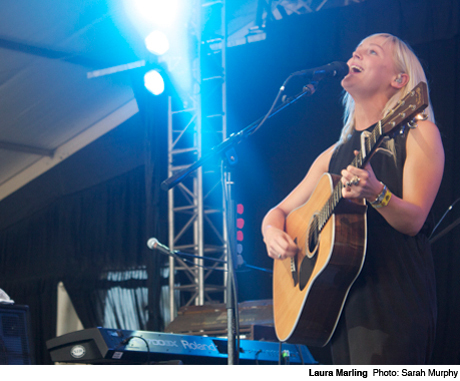 Despite being just 22, Laura Marling has only improved with age and each album. Her latest record, 2011's A Creature I Don't Know, presented a bit of an old soul, with musicianship and lyricism that exceeds that of most of her peers, both in wisdom and talent. So when Marling emerged on to the stage at That Tent, it was refreshing to see a smile break across her face and watch her take in the sea of people that had gathered to watch her play. Opening with "Rambling Man" and "Blackberry Stone," Marling also delivered older favourites like "Alas I Cannot Swim," "I Speak Because I Can" and "No Hope In the Air," then rounded out the setlist with newer material from Creature. Noting that it was a rare occurrence, Marling sent her band off stage to perform a single song solo, before being rejoined by them and finishing off a memorable and endearing set of her bluegrass-infused folk pop.